As a diabetes educator/healthcare provider (DHCP) I’m observing that the rapidly growing world of the Diabetes Online Community, (the DOC) is helping people with diabetes (PWD) and their loved ones find support, feel supported. People are connecting, building relationships and feeling more positive about the challenges of managing their diabetes. I’m delighted to see this trend! As a DHCP I’ve long realized that I can’t walk a mile in a PWD shoes (or in the case of this interviewee the shoes of a parent of a child with diabetes). I can’t know what it is like day in, day out to deal with this challenging and relentless disease. But, what I do know is that we can learn from each other to change the dialog between providers and PWD to be more positive, more supportive. In these Dialoging about Diabetes blogs I interview diabetes activists and social networkers with the goal of gathering ways DHCPs can change our practices to better support the diabetes care efforts of PWD and make living real life…just a bit easier.Here’s my dialog with Leighann Calentine, the mother of Quinn, now 8 years old. Quinn was diagnosed with type 1 diabetes when she was 4. Today Leighann is an active diabetes blogger about parenting children with diabetes at d-mom.com and is the author of a must-have, fresh off the press book, Kids First, Diabetes Second. She blogs for Suite D, OmniPod’s online diabetes community. Leighann is frequently included in the top 10 of diabetes bloggers. HW Q: Please describe Quinn’s diagnosis of type 1 diabetes, how you and how your family coped in those early days? LC A: Quinn’s diagnosis was similar to many other children. She had been sick with a respiratory illness and never quite bounced back. The tell-tale signs of diabetes showed themselves including frequent urination, excessive thirst, weight loss, and mood swings. She would wake up shortly after going to bed begging for a drink of milk. At preschool she would melt into tears over the tiniest things. When she drank an entire half gallon of milk in one day, we called the pediatrician. Our pediatrician diagnosed it the next day and before she was in DKA (diabetic ketoacidosis). In Kids First, Diabetes Second, I detail the nerve wrenching 200 mile drive to check Quinn to a children's hospital for diabetes treatment and our initiation to caring for a young child with diabetes. Fortunately we had a support system in place back home to take care of our almost-one-year-old baby while we focused on learning to care for Quinn. My step-sister, who also has a child with type 1 diabetes, greeted us when we returned with a bag full of supplies and books. HW Q: How long did it take you (as Mom and Caretaker-in-Chief) to get your “diabetes sea legs”? What and who were most helpful in this transition? 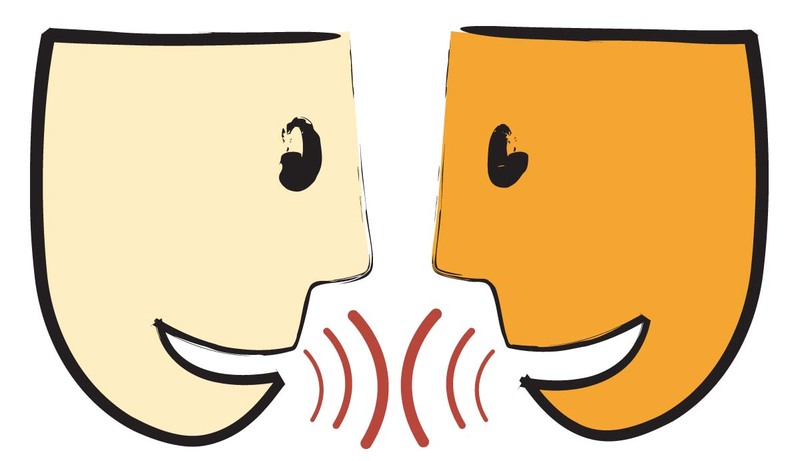 What are your key learnings, the messages you want to communicate to others about those first few days and weeks? LC A: I found it incredibly scary to be released from the hospital after only a few days of training and being charged with literally keeping our child alive. To say the least, it's a daunting and overwhelming task! I tell a story about being released from the hospital and having our very first meal in charge of her carb counting and bolusing at a Denny's off the highway. I asked for nutritional information at the restaurant and of course they didn’t have any pamphlet on site (it was before apps were around). I wondered how in the heck I was going to get the carb counts for her foods every single meal for the rest of her life! We had to just jump right in and make our best guess. I count us fortunate that we received extensive education in the hospital and were sent home with books, lots of notes and a number to call at each meal to go over her glucose results and insulin dose. I hear of families who receive minimal education and aren't given a 24 hour lifeline to educators and endos. Education and support are incredibly important in managing diabetes in those early days and weeks as you learn to manage. It's so easy to be overwhelmed by this diagnosis and think that your child's life will never be the same. But parents can and will deal with it and your child absolutely can be a healthy and happy kid...including eating birthday cake with their friends! HW Q: What are your key learnings and messages to us healthcare providers (HCPs) about helping parents cope with and learn about diabetes and its management? LC A: DHCPs learn about diabetes management over the course of several years; parents have a few short days to learn everything. The emotions coupled with an overwhelming number of daily decisions can make a parent's head spin. It's important for DHCPs to remember that most of us don't have a background in the medical field and so much of the jargon and medical information is brand new. Patience, support, and understanding go a long way to help parents adjust. Because it's a lot of information, focus on the basics--the most important things to know--and circle back to teach them more and more as they synthesize the initial information and seek out greater knowledge. HW Q: It’s so clear that activism is in your blood. I chuckled when I read in Kids First, Diabetes Second, “Once we made our selection [for a school for Quinn], I attended a school board meeting and also introduced myself to the superintendent…” What led to you engaging with the Diabetes Online Community (DOC), starting your D-Mom Blog and writing this book? LC A: Why not go straight to the top, right?! I have found that building good relationships with school personnel has helped me advocate for Quinn’s needs during the school day. My relationships with school personnel go beyond just diabetes. I volunteer at school when I can for parties and field trips and make myself available as much as possible. I have found a way to get my needs met by staying on an even keel. Just complaining isn't productive, helping to find solutions is. 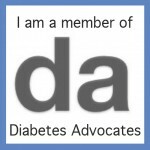 The Diabetes Online Community has been a tremendous resource for me. I had been writing a blog about motherhood for over a year when Quinn was diagnosed. A couple of months after Quinn’s diabetes diagnosis I decided to start writing about what we were going through. I was surprised by the outpouring of support and quickly began building a network of parents of kids with diabetes and adults who were diagnosed as children. Reading the blogs of adults such as Sixuntilme by Kerri Sparling, gave me so much hope in those first months. I saw that my daughter could have a great life. It was so reassuring to know that boys would like my daughter despite her diabetes, that she would find good friends to support her, and that she could get an education, travel, and have the other normal experiences that other kids and young adults have. My online advocacy efforts were not intentional in the beginning, but at a certain point the scale tipped from me seeking support and answers to giving them. At this point four years into this journey I find the more I learn and know, the more I want to share. When the Kid First, Diabetes Second book project presented itself, it seemed like a good way to reach parents who may not be online looking for information and a support system. I wanted to put out information about and invite parents into the DOC. Diabetes can be very isolating if you aren't in contact with others also dealing with it. HW Q: What in your heart do you want this book to accomplish for parents and kids? LC A: I don't want parents of newly diagnosed children to have to start at square one. There is so much more to diabetes management than they teach you at the hospital, like how to navigate birthday parties, sports, and keep track of all the "stuff." It’s all the real life part of juggling diabetes. That’s what I wanted to offer in the book. My daughter had several birthday parties to attend within a couple of weeks of her diagnosis. The best advice a diabetes educator gave me was to let her be a kid...and eat the birthday cake! I have tried to keep the philosophy that life is about more than a few blood glucose results as we have parented Quinn over the years. Additionally, I have found that parents of kids with diabetes are their own worst critics. We have a tendency to internalize A1c's and low and high blood glucose results as an assessment of our parenting abilities. I want parents to know that they shouldn't take these numbers as grades, but rather information that can be used to learn, make therapy changes and move forward. I genuinely wish I could get Kids First, Diabetes Second into the hands of every single family at the time of their child's diagnosis of diabetes with my primary goal being letting them know that someone else understands exactly what they are going through. Then over time and when they are ready to digest more content to read the other sections of the book, such as dealing with holidays, formulating 504 plans for school, cooking and counting carbs, attending birthday parties, and much, much more! I believe that the parent to parent connection is so very important. HW Q: If you could give DHCPs (especially those who work with kids and families) a few tips to improve our understanding of the challenges PWD face in managing diabetes while living their real life, what would you tell them? LC A: There are so many factors that affect blood sugars. A + B doesn't always equal C like we are led to believe it’s supposed to. I remember having a playdate with a girl and her mom a few weeks after her diagnosis. The mother was a mathematician and just couldn't understand why her daughter had a blood sugar in the 200's even though they had counted carbs, corrected the pre-meal blood sugar, and done the math. I told her that that wasn't the last 200 they would see and that sometimes it just doesn't work out like it's supposed to. I think DHCP's need to let parents know that day-to-day diabetes is rarely textbook. In real life there are surprise birthday cupcakes at school with unknown carb counts, an impromptu playdate at the park after school with lots of running around, and all sorts of other things that you just aren't prepared for like illnesses, growth hormones, changing schedules and lazy days that can all affect blood sugars and the insulin:carb ratios and correction factors. LC A: We worked with one nurse practitioner who I never felt listened to me or Quinn. I dreaded these appointments when we saw her instead of our endocrinologist. I would shut down and go into the appointment knowing that I wasn't going to gain anything except knowing what my daughter's latest A1c was. It's important for DHCPs to take the time to listen and allow time during appointments to let their young patients and their parents talk. HW Q: How would you like to see other parents of kids with diabetes, adults with diabetes connect online to get and give support, learn and potentially improve their control and care? LC A: There's a world of online resources. The great thing about these online communities is that people speak from experience and the heart. They share real life experiences of using products, dealing with highs and lows, chaperoning field trips, taking kids to dance or sports, and working within their schools. Not to discount the knowledge and efforts of DHCP's, but asking questions and hearing answers from people who walk in the same shoes, people who "get it" can be an added layer of support and knowledge for those dealing with diabetes either in themselves or their children. There are lots of "aha" moments as you learn a new trick or figure out why something is just not working out and how to make it work better. HW Q: How do you encourage DHCPs to view and promote social networking to clients and colleagues? LC A: DHCPs might be afraid to venture into the online world. Most people using social media aren't trying to take the place of the medical advice that is being given by DHCPs, but are sharing their stories. This is a powerful thing. I am constantly touched when I receive a comment or note from a parent saying that they read our diagnosis story and it mirrored their own, that a particular post spoke to them, or that a tip helped get them through. DHCPs can look at social media as a way to help with the aspects of diabetes that go beyond the nitty-gritty of daily management. HW Q: What are a few key online resources that you find helpful day to day in helping Quinn manage her diabetes and that you suggest to parents walking in your shoes? LC A: My online feed reader includes at least a hundred blogs written by both parents of children with diabetes and adults with diabetes. I suggest finding a few blogs you like and then look at their blog rolls and the people who comment on these blogs to widen your circle. Though I wasn't an early adapter to Facebook, like I was with Twitter, I find myself gravitating toward Facebook where I have a core group of friends also dealing with diabetes. Someone is almost always up at 2:00 am! Another great community is Children with Diabetes (CWD). 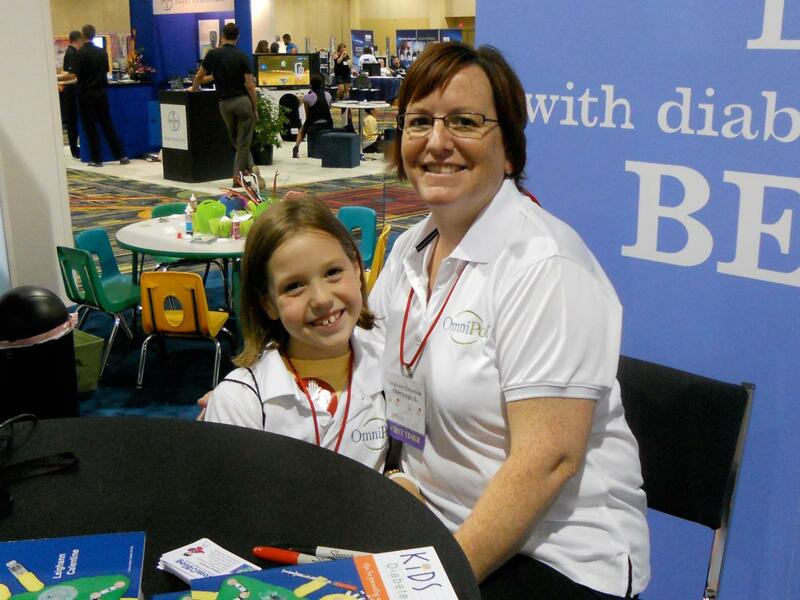 This past summer Quinn and I attended the annual CWD Friends For Life conference in Orlando. There were several thousand attendees, all affected by diabetes in some way including not only CWD, but also their parents, siblings, and grandparents. Diabetes was very "normal" that week. While parents are in sessions learning about both management and the emotional aspects of diabetes care, children were in their own sessions having fun, bonding, and meeting some VIPs who also have type 1 diabetes. HW Q: How can people connect and follow you online? LC A: I'm everywhere online! You can find me on D-Mom Blog, Facebook, and on Twitter where I tweet as @dmomblog. HW: Thanks to Leighann Calentine for writing Kids First, Diabetes Second. It's a from the heart, hands-on guidebook for parents of kids newly diagnosed with diabetes or for those who’ve been at it for some years. As Leighann says, there’s always more to learn and another tip or two to pick up along the way. It’s a book for parents of kids with diabetes, grandparents and other caregivers in a child’s life. DHCPs should also pick up a copy. We can all gain insights about the day to day realities of managing a child with type 1 diabetes.